A rendering of one of the complete street concepts for West Peachtree Street in Midtown, looking north. 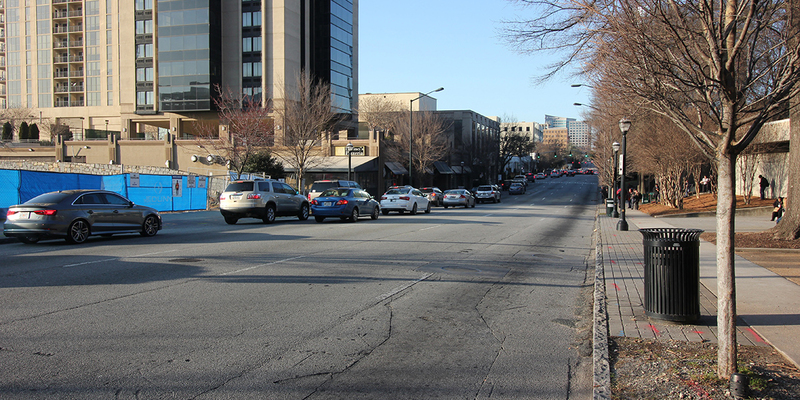 The image above shows existing conditions for West Peachtree facing north. 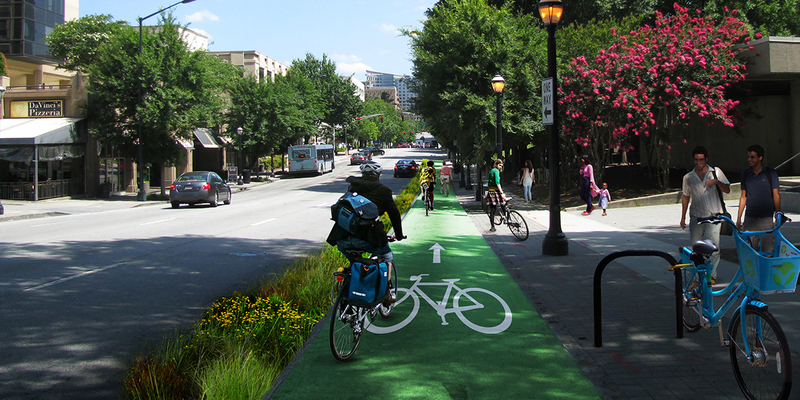 Midtown Alliance, in partnership with the City of Atlanta’s Renew/TSPLOST Program, is planning improvements to Spring Street between North Avenue and 17th Street and West Peachtree Street between Peachtree Street (north) and Peachtree Street (south). These corridors were identified for improvements in the Atlanta’s Transportation Plan and identified as a “complete street” projects by the 2016 TSPLOST Referendum, as well as the Midtown Transportation Plan. Complete street projects are intended to increase safety and accessibility for all street users, especially for people walking, biking, and with limited mobility. Renderings were created as part of the Midtown Transportation Plan stemming from a robust public engagement effort. The project is now in the scoping phase of work. This phase of work includes additional public and stakeholder engagement, existing conditions analysis, traffic impact assessment, and 30% design documents. Scoping work kicked-off in January 2019 with a survey conducted in 2018. This phase of the project is anticipated to last approximately 8 months. Click the button below to view and add comments on what you’d like to see addressed on each corridor via our online public comment portal. To view responses to written comments submitted at the February 20 public information open house, please click here.